On a lazy day, French Toast is usually my saver for Breakfast. I somehow dislike cereals and oats and can never have it for breakfast. Making any traditional Kerala breakfast is time consuming and so I reserve those for weekends. 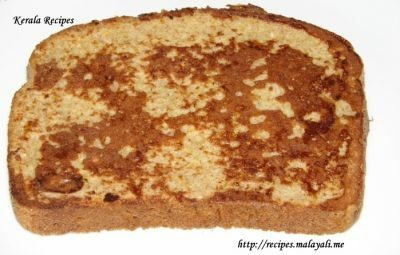 French toast is more commonly known as Bread Roast in Kerala. Here is my recipe for moist and sweet French Toasts which can be made within 5-10 minutes. Check out the recipe for Eggless French Toasts here. Beat the eggs along with milk, sugar and salt. Heat a non stick pan. You can apply a dab of butter if you want but I always skip the butter. Dip both sides of the bread in the beaten mixture and place it on the pan. The key to making moist French Toasts is buy dipping the bread thoroughly in the beaten mixture so that the bread absorbs the liquids. Fry for a few minutes till both sides brown. Serve these hot bread toasts along with a glass of milk.